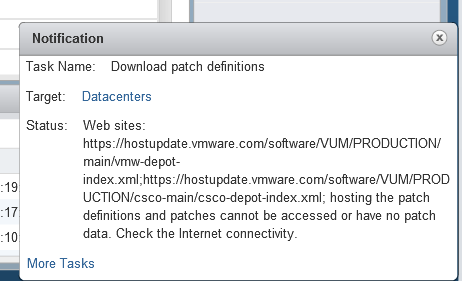 Here is a problem that I came up against when trying to use Update Manager on my newly installed vCenter Server Appliance (VCSA). The same ‘fix’ would apply to those trying to perform an update of the VCSA/PSC itself. First click on Download Settings in Update Manager / Manage and enter a proxy address if required. (See my previous post on setting the https proxy). This is common for corporate networks where you probably do not have direct access out to the internet. With this we are effectively trying to download that URL from the command line. If there are any issues, we will be able to see them and get any errors if there are any. If you see a result such as the one below where the certificate its referring to is not from VMware but one that looks local from your proxy server, you may well have SSL Interception enabled at your corporate proxy server. Show number of entries in a particular store, eg TRUSTED_ROOTS, which is where we will want to import out certificates. Notice now that the number of certificates has increased to 6. Retry the wget command you should find that it completes successfully and Update Manager is able to succefully connect! Next Post: Issue: Horizon View 6.2.4 + Teradici Zero Client | Don’t upgrade just yet!